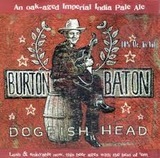 For Burton Baton, we brew two “threads,” or batches, of beer: an English-style old ale and an imperial IPA. After fermentating the beers separately in our stainless tanks, they’re transferred and blended together in one of our large oak tanks. Burton Baton sits on the wood for about a month. When enjoying the Burton Baton, you’ll find an awesome blend of the citrus notes from Northwestern hops melding with woody, vanilla notes from the oak. The wood also tends to mellow the 10% ABV of Burton, so tread cautiously!